Today I have pictures of the front and backs of the pages I will be putting together into my art book. My friends in the little group I belong to each did a couple of the pages and there's also one from my friend Arlee. The front cover is what I did. My theme was beverages (mostly coffee & tea). I'm so thrilled with it and now have to make the back cover and put it together. As for the sniffling, snuffling, and dripping part....spring allergies. What more can I say? This will, hopefully, turn into a wonderful long Khalat coat! The outside will be denim (what else? ), but I'm planning to do some playing with shibori and also lots of hand stitching on it. I might even throw some of my crazy quilting style into it. The lining will be this wonderful taffeta. Both fabrics were found at our local Fabricland for $5 a metre!!! I can't wait to get started on it. (Thanks Arlee, for sharing!!). Oh, and before I forget, Marie has some more wonderful beaded things available for the Ride To Conquer Cancer fundraiser. Just $5 each! Check them out at her blog: http://sredeluxe.blogspot.com and just follow the link there to Amy's Ride! I've already claimed several. Remember this???? The red blob? Lookie! It's a sweater AND (drum roll) it actually fits!!! It doesn't have any buttons yet because I haven't found any I like. It is the first knitted garment I have made and I am so happy to have it over and done with. It's the Einstein coat pattern from Sally Melville's knit stitch book, the name of which escapes me (and I have loaned it to a friend). I will edit the post to include that info shortly. HERE'S THE INFO: 'The Knitting Experience - Book 1: The Knit Stitch'. Now I'm about to try something to see if the linkage problem I've been having is now figured out. Please bear with me. This is a test to see if this link will work now: Nope, didn't work. Back to the drawing board on that one!! YEEHAW!!!! I think I got it!!!! Will somebody please let me know if it worked?? Thanks! HUGE thanks to Arlee for bailing me out...again. As promised, here is more information about the 'Ride to Conquer Cancer' fundraiser I talked about several days ago. My friends Marie Alton and Cathy Ross (who are sisters) are doing a wonderful thing to help their niece Amy raise funds as she participates in the 200 km bike ride from Toronto to Niagara Falls, with the proceeds going to the Princess Margaret Hospital Foundation. There is an excellent description on Cathy's blog (http://thedepthswithin.blogspot.com) and there you can see the wonderful jacket Cathy has up for auction. She makes THE most gorgeous clothing!! Please make a bid if you are interested!! AND...as I told you before, Marie has some beautiful bead work available (for only $5 each!!) on her blog (click on the picture titled 'Amy's Ride') http://sredeluxe.blogspot.com. All proceeds from those are going to the cause, plus Marie is matching your donations! I have a couple that will be coming my way and, because I already own a few pieces of Marie's work, I know they will be beautiful. Please help if you can. WHY OH WHY HAS BLOGGER DECIDED NOT TO LET ME LINK?????!!!! Sorry! We have flowers. Real ones. In the garden. And the snow is melted away!! Roll on, allergies - I'll welcome you back with open arms if I can only have some warmth! I'm not so sure, however, if I feel so benevolent towards our postal service in this country. They seem to have managed to misplace a piece of our Exquisite Corpse round robin, which is thoroughly maddening (and most of all, disappointing to the owner). All that hard work is gone...somewhere....with no means of tracing it. The only hope now is that somehow it will get returned to the sender, but what are the odds? It's not that the piece was a little tiny postcard, which you can understand perhaps getting lost in the equipment. From now on I will be sending all my art pieces 'traceable', even though there is more cost involved. Oddly enough, this is the SECOND time this has happened with a 'corpse' piece (Arlee's finished piece never arrived home from the first round). Very disappointing. These are the beginnings of another denim creation. I think I will be adding some felt flowers and some hand stitching to this one. The wonky-looking 'things' lying on top are meant to be pockets, but they are going to change to something more useful before I sew them down. The pattern is a tutorial from Handmade by Alissa and Sew,Mama,Sew - the Quilted Garden Tote. Of course theirs was done using cottons, but I just HAVE to use denim!! I found a couple of interesting sites today and thought I would share #1 is http://boggleboy.deviantart.com/gallery/ where you will see a huge number of very kewl dolls. Well worth having a gander around. #2 http://vickiwelsh.typepad.com/field-trips-in-fiber/color has a series of colour studies on her blog (look for the 'colour' title in the sidebar). Brrrrrr...it's cold with no clothes! And she has to wait til July! It's a good thing the weather is getting a bit warmer because this little lady is going to be hanging around nekkid! She's approximately 14" long, which will fit within the size requirements; it's not my usual sizing because I've pretty much always worked at 18-20". It was fun making her and now it's on to creating my journal to travel along. Today I've played around with possible heads for my doll. I haven't had much practice at needle sculpting (as you can tell from the head on the bottom left!!). The one on the bottom right is a winner, but I think I will try sculpting a couple of the others to see what happens. Also, my friend Marie Alton is currently doing a fundraiser and what she has on offer is pretty cool! Her niece Amy is riding in the 'Ride To Conquer Cancer' and Marie is helping raise money for the cause. If you go to her blog at: http://sredeluxe.blogspot.com and click on Amy's picture you will see some pretty lovely beaded items that Marie has done. I've already bid on a couple of pieces. Marie's sister Cathy is also planning something to help and once I know more, I will post about it. I discovered last night that Maureen Greeson has a blog now... http://www.maureensvintageacquisitions.blogspot.com will take you there. She does beautiful crazy quilting!! ARGH!! Blog-grrrr is refusing to link for some reason unknown to mortal man. Sorry! I think this will be my doll for the collaboration I've been asked to join. There's a long way to go before she's ready to go off on her adventures and I won't know if this is 'the' one until I actually get her put together. I've put a head together but it's not quite what I want, so it's back to the drawing board. This doll was cobbled together from several different patterns - some bits from Patti Medaris Culea and the rest has been my own invention. Next I have to decide whether to gesso her or leave her alone...decisions, decisions. But not enough time to execute them so far this week. Starting the week off with a holiday seems to have completely messed me up. That, and the fact that DH decided it would be in his best interests to fall down the basement stairs meaning that I have to take over the cooking and pretty much everything else until all his bruises heal. Nothing broken, thank goodness, but he's not moving too far at the moment. It appears that his knee gave out at the top of our small pair of steps leading up to the kitchen and, when he grabbed the railing, somehow he managed to do a pirouette and flung himself down the larger set of stairs. Once the fright was over I reminded him that he was too old to be taking up ballet. This morning I asked him what DIDn't hurt (which is a much shorter list than listening to what DOES hurt). He's not a complainer tho', which is a good thing!! Just look at this wonderful pie!! It's the very first pie our son's girlfriend has made and she has reason to be proud! She asked Jack if he would teach her how to make an apple pie (including the pastry) so that was their project on Saturday. He showed her how while he made the one on the left and then she made the one on the right all by herself. She's done something I have never been able to manage and that's making pastry. If a pie doesn't have the good ol' graham cracker crust it won't get made if I have anything to do with it. I won't say just how many failed pastries ended up in the garbage before I admitted defeat!! (Obviously I didn't do a very good job of scanning the picture!). However, I just wanted to wish a very Happy Easter to everyone and leave you with the strains of a 'certain' song that starts with 'In My Easter Bonnet, with all the......'. Now I know that you all are going to be going around humming that song for the next few hours and you'll be perfectly in tune (hah) with the season! Does anyone happen to know of a source where I could find a product called 'soutache braid'? I have been commissioned to make a ring bearer's pillow and the idea I have in mind uses it. Thought it would be fairly simple to track down, but I haven't had any luck. It's not that I NEED it, but I WANT it!! Here's an interesting site I stumbled across: http://dollmakersmuse.blogspot.com (darn it, Blog-grrrr isn't linking again!!). Anyhoo, there is tons of info on this site about dollmaking. 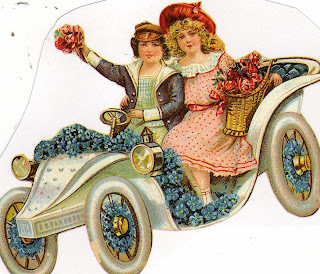 Yesterday I was the designated driver to take friends Irene & Sue on a shopping expedition. We hit all the good places - Michaels; a really decent dollar store; Chapters; Canadian Tire; and, of course, Tim Horton's for the necessary intake and outgo of fluids. Fun day! I finally succumbed (as did Irene) and got a lovely little soldering iron to set the smoke alarm off with. Have to like these tools that create such chaos!! Can't wait to have time to play with it. Knitting? You wanted to know how the knitting was coming? Well. Ummmm. I kicked the bag it's in today. Does that count? I WILL finish the sweater, I will finish the sweater, I will finish the sweater, chug, chug. However, I will go batty if I don't get it done soon. Sorry, no pictures today....busy. Knitting. I made this bag on the weekend from a pattern called the 'Bali Bag' which was published in the January 2007 issue of QUILT magazine (thanks Donna!). I, of course, being a lover of denim, decided that it would be a perfect use for some of my stash. I don't happen to have any Bali fabrics in my stash so the decision of what to use was pretty easy! I had exactly four of the purple flower buttons in my stash and I thought they looked rather cute with the happy face beads for centres. btw...excuse the mess in the background!! Oh yeah...I've been knitting my little fingers to the bone and finished one sleeve up. Only a hundred and some odd more rows to go....sigh. I'm actually knitting. This sweater WILL be done...someday. I hope. It's one of those knitting projects that beginners undertake for their first 'large' project. Something safe. Something easy. Something so mind-numbingly BORING that you begin to wonder why you decided knitting might be fun in the first place. Something that, as you're knitting, you feel distressing thoughts that after ALL that m-n BORING knitting, might not even fit. Yeah, it's that sort of project. I WANT IT DONE!!!!!!!!!!! For those of you who have been wondering, here's a picture of our one-eyed wonderdog Odin and his partner in crime Gypsy. As you can see, Odin is having a grand time barking at the camera and Gypsy is poised to nip at his back leg (either to shut him up or to start a wrestling match...which, btw, he allows her to win). I did take a picture to show you today, but it's dead boring so I decided you really wouldn't want to see it! I tried another experiment with the air drying clay and tried wrapping some around crumpled aluminum foil. It, too, peeled off in the same manner as on the doll. Hmm. I have now tried rolling it into a couple of balls to see if it is of any use as beads. Don't forget that this particular paper clay is from the local dollar store, so it may not be as 'good' as the more expensive versions. Received the latest issue of 'A Needle Pulling Thread' magazine (which is a Canadian publication) and noticed the following (quoting Carla A. Cononico, editor-in-chief) "...very pleased to announce the launch of our online needlework business directory, www.theneedleworkpages.com where we've listed over 1500 needlework-related businesses of all types across Canada". I haven't had a chance to check it out yet, but it certainly sounds like it might be a valuable resource. Another thing I noticed in the magazine is a link to a site concerning textiles (again in Canada). This is what it says: "Joe Lewis....has been presenting Canadian Textile and Fibre arts since 2005 in fibreQUARTERLY on-line at www.velvethighway.com". Again, I haven't had a chance to explore, but it also sounds like it might be interesting. 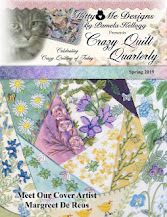 It's been a good mail week because the latest Quilting Arts magazine arrived today. I haven't had time to do more than leaf through it quickly, but I can see a number of articles I'm looking forward to reading as soon as I have a few minutes. There was a notice on both Allison Aller's and Marie Alton's blogs today that Maureen Greeson has re-opened an on-line shop. 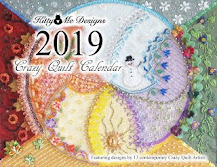 Good news for anyone interested in crazy quilting! http://www.maureensvintageaquisitions.com if you'd like to have a look. ANOTHER PUZZLEMENT. WHY oh why has Blog-grr now decided that it doesn't want to have the links 'linkable'??????????? At least today it didn't decided to underline my first sentence like it has been. Must be spring fever. Lately I've been doing a lot of research about book publishing. It's not exactly an enthralling subject to read about. Quite boring actually. Mind-numbing. However, there IS a reason for it and here you see a couple of pictures of my 'project'. 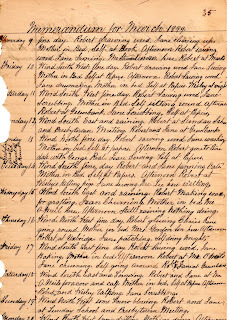 This over-large tome is the diary of my great-great grandfather (John Albert Michie, b. Oct 17, 1813, d. Feb. 15, 1900) which was written from February 24, 1869 until March 22, 1899. He was a farmer and wrote on a daily basis about the daily life of the times. Fascinating reading, if you like that sort of thing. I'm told there is an interest amongst genealogists and historians for this type of subject matter, so I am going to attempt to have it published, probably in two volumes. The original is in a state of disrepair and cannot withstand too much handling so it is best to recopy it very carefully. I've been wrestling with a lot of decisions concerning the book(s)...should I re-write it in it's entirety or should I edit out what is of the same old/same old wording? Do I include the fact that each and every day he recorded the weather conditions? How do I make the book seem interesting enough for people to want to read? What computer program do I use; what font; what size; what pictures to include; what, what, what...and better yet, HOW am I going to find time to do something of this magnitude?? I realize the historical value of it all and, because of that, I'm sure it is a project well worth undertaking, but at what cost? oh....and just to make the whole thing even MORE interesting is that John's son wrote about HIS life covering at least another 40 years!! !